I have just recently returned from leading the Light and Land tour of Vermont and Maine with my good friend and co-leader Clive Minnitt. 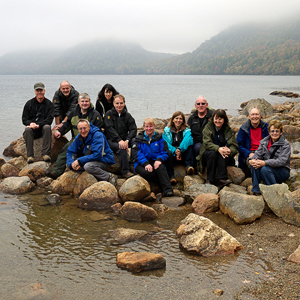 This was the second year that we have combined tours to Vermont and Maine, having previously lead five week long tours in Vermont and two in Maine. 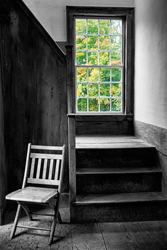 Prior to this we both attended a Vermont workshop as clients, which was lead by Charlie Waite way back in October 1997. So you can see that we both seem to love New England in the fall! We were particularly excited about this trip as we had not had the chance to visit in 2011 meaning it had been a full two years since we had met up with our many friends in the region. The forecasts for fall colour, particularly in Vermont, were looking good as we headed out for a three day recce on 25th September. The recce went particularly well. As well as finding some spectacular colour in the area around Route 232 and the Groton State Forest, we also managed to identify 3 or 4 completely new locations (there’s always something new to find if you look hard enough) to add to our potential itinerary. In the end, weather conditions prevented us from using some of these so we can’t wait to go back and try again. After picking up all our clients from Boston Logan International on the 28th September we headed back to the Vermont state capital, Montpelier, where the first part of our two centre tour was to be based in the Capitol Plaza Hotel. 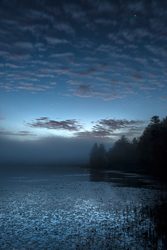 Sadly the forecast for our first couple of days in Vermont wasn’t great – low cloud, mist and light drizzle, so we cheered up our clients by informing them that there would be no dawn shoot the following morning. In order to make the most of the fantastic colour we had found on our recce, we headed straight to the Groton State Forest at the first opportunity. Riddel Pond was spectacular with amazing reflections, and Kettle Pond and Boulder Beach State Park on the shores of Lake Groton filled the rest of the day. After a full day of photography we enjoyed dinner at Positive Pie in State Street, Montpelier, where they offer a particularly enjoyable Chocolate and Coffee Stout! As the week progressed the weather began to improve and it was on day 4 that we were able to venture out for our first dawn shoot. This turned out to be a spectacular dawn at our old favourite, Bliss Pond with stunning colour, mist and reflections to keep us all busy. Other highlights in Vermont were a visit to our friends at the 1782 Settlement Farm who are always amazingly welcoming, an absorbing few hours at Old West Church whilst the rain came down outside and of course some time spent with our good friend Bruce Cliché and his amazing collection of ancient cars and assorted other vehicles. All this was set against a backdrop of fantastic fall colour – one of the best displays we had ever seen. On 4th October the inclement weather returned, but this didn’t affect us too badly as this was “moving day” and we were off to Acadia National Park. The route takes us across the famous Kankamagus Highway in the White Mountains of New Hampshire, famed for its spectacular views of millions of turning trees. Sadly for us we may as well have been in Swindon for all the views we had from deep inside the low cloud that cloaked everything above a few hundred feet. Still at least this lack of distraction meant that we arrived in Bar Harbor nice and early and had time for a rest before dinner at McKays. 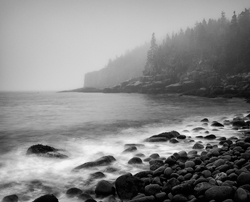 For me the best part about our 2012 visit to Acadia was the variable weather conditions we experienced. From beautiful sunshine to misty (almost foggy) mornings, with a complete lack of wind to ruffle reflections, we were given lots of opportunities for creating great atmosphere in our photographs. As always a special highlight was the afternoon spent in Wonderland followed by a sunset visit to Bass Harbor Head Lighthouse. 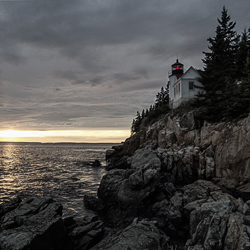 The lighthouse is always an adventure with plenty of opportunities to rub shoulders and compare notes with other photographers from all over the world! On this occasion conditions rewarded those who were willing to wait for the light. It is a common occurrence that people give up too early, particularly as it is necessary to arrive some time before sunset in order to guarantee an uninterrupted view from the best spots. I cannot criticise those who missed the spectacular last light though, because I was one of them. My Nikon was stubbornly in the boot of the van (a few hundred feet up the cliff path) and the battery on my LX5 ran out as I took this last shot. You can imagine that as the sun dipped into the gap on the horizon and lit the bottom of the clouds with rich colour the view was amazing. So I’m looking forward to seeing some results from those who stuck it out – Dave, Roland, Roger, Mike & Clive. During our last couple of days in Bar Harbor we were really pleased to fit in a couple of hours to look at work brought along by nearly all the group. This is always a highlight for Clive and I. We always enjoy seeing people’s work and firmly believe that the discussion and debate this can generate is an invaluable part of the learning process. Inevitably though, the time when we had to head back to Boston was soon upon us and our New England extravaganza was over all too quickly. Thanks to everyone who joined us in New England in 2012. We were delighted to have a group made up of 6 different nationalities – all united by a common love for photographing the beautiful places in this world. Luckily for Clive and I, the dates for New England 2013 have already been confirmed and bookings are being taken. So if you fancy joining us or simply want to find out more, please visit the “Workshops” link above. Also, please do visit the gallery pages to see more of my images from this trip, or alternatively, check them out on my Facebook page where you can give me some direct feedback as well!